How Many CPAs Are There? As of April 22, 2016, there are 664,532 actively licensed CPAs. 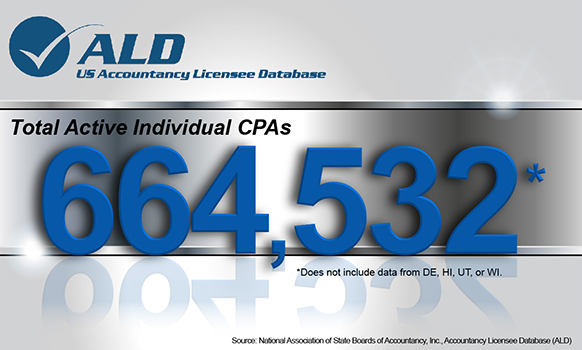 This statistic is derived from the national database of CPAs, the Accountancy Licensee Database (ALD), and is made up of official Accountancy Board data that is currently aggregated from 51 of the 55 CPA licensing jurisdictions. It represents the total number of individual CPAs that are considered to be in an "Active" status by their respective Boards, a majority of which can be matched across state lines to assure licensees who are licensed in multiple states are only counted once.